The duo is simply fishing both the dry fly and nymph at the same time. Fish can and should be caught on both flies on productive days. The dry fly for fishing the duo must float exceptionally well and not be prone to water logging. It supports the weight of a beaded nymph (often a small tungsten bead of about 2 mm). Many fly fishers use a Klinkhammer in pocket water at short range in a technique referred to as "clink and dink". The klinkhammer is a fantastic fly but not the best for this method. The tendancy is for the fly to become waterlogged after a few fish. Once the fly starts to sink it becomes difficult to resgister takes on the nymph. The fly fisher has to change the fly or get frustrated. Dry flies designed specifically for Duo often overcome these drawbacks. Caddis patterns are in my opinion the best dry flies for fishing in conjunction with a nymph. They can be near unsinkable with a deer hair wing, a buoyant body material and several tight turns of a good genetic hackle tied which repels water and sticks in the surface film. This is my duo set up. 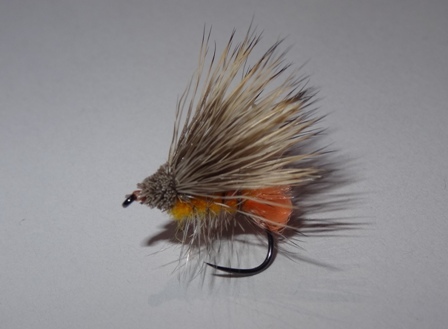 The duo dry fly Life Jacket elk hair caddis used in this video is available to buy.